WHITEHOUSE STATION, NJ — The most convenient way for your million dollar dreams to come true may be with your morning cup of coffee. With Saturday’s (March 16) Powerball lottery jackpot estimated to be $495 million, your neighborhood QuickChek may be just the place to start your day and those big dreams. Known for its award-winning sub sandwiches and renowned fresh brewed coffee, the fresh convenience market chain is fast becoming known as the lucky source for lottery players, too. 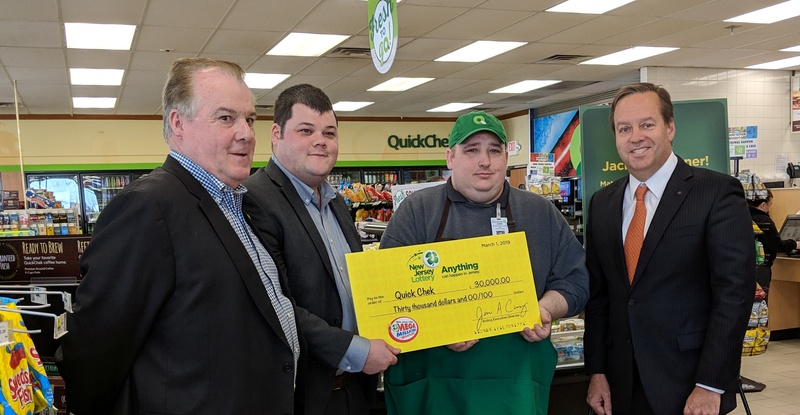 When the QuickChek store in Phillipsburg sold the lone winning $273 million Mega Millions lottery ticket on March 1; it capped a string of recent million-dollar winners for the convenience store chain. News of Mike Weirsky’s huge $273 million win earlier this month went viral — not just because he was the lone winner and for his personal story, but as much as for QuickChek store team member Phil Campolo finding and holding onto the tickets Weirsky had purchased that night and left behind at the store’s counter. Singled out by national media as a Good Samaritan, Campolo’s actions exemplify the honesty and integrity of the employees of the Whitehouse Station, NJ-based chain and its core mission of Total Customer Dedication. Campolo knew someone left the tickets behind and held onto them until Weirsky came back two days later looking for them. The huge lottery payout was the largest following a string of recent million-dollar winners in company stores in recent weeks. QuickChek stores sold a $1 million winning scratch-off ticket in Rockaway and produced a $1 million winner in its Highland Park store, both taking place in February. In March 2018, the company’s Bedminster store produced a $1 million Mega Millions winner. And in December 2017, a winning QuickChek customer in Bayonne was $4 million richer. There are 158 QuickChek fresh convenience market locations throughout New Jersey, the Hudson Valley and Long Island. To find the nearest store visit www.quickchek.com. It could be the richest cup of coffee you’ll ever have.